Here's a couple shots from a recent yard sale I happened upon. Very rarely do I go to yard or garage sales but, on this day the sale seem to beckon me. Usually if I'm feeling "led" to go somewhere I wouldn't normally go I break out the camera. Reason being 9 times out of 10 there's gonna be some weird photo opportunity. This sale was no exception. 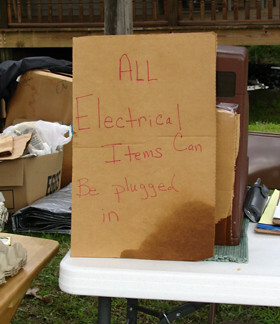 As you'll notice I stumbled upon a sign that reads "All Electrical Items can be Plugged In"... really? Then a short time later I noticed a big burn pile. 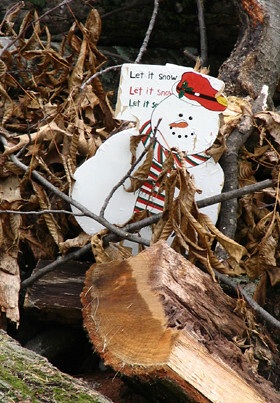 In that burn pile was a snowman holding a sign that read "let it snow, let it snow, let it snow"... little does he know.